I don’t have to say how much I love cold weathers. Everything about it makes me happy (apart from driving, of course! ), but layering is my favorite part. I enjoy mix and matching and wearing more clothes :), it just makes dressing up challenging and fun. I know not everyone loves Winter, but hey! don’t let the weather get you from dressing up and feeling great! 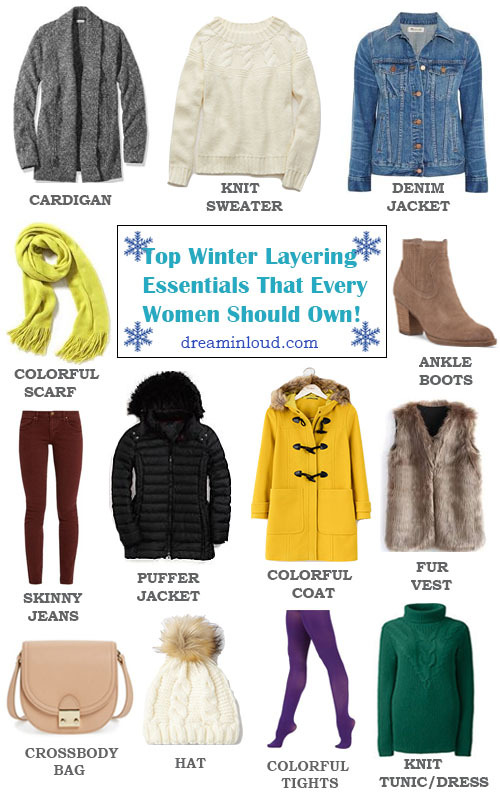 Here are my top Winter essentials that will get your through a snowstorm or a warm day in style. 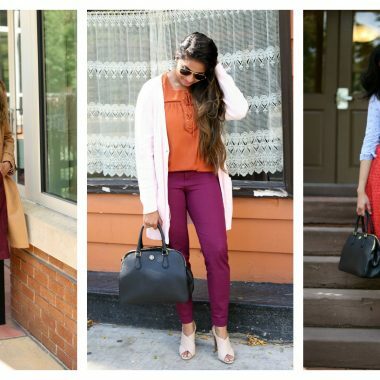 Cardigans are every office going girl’s bff (I know right!). They are the most effortless transitional piece. Wear it with a button shirt or around neck sweater under a wool coat when the temperature drops. By proper layering, a knit sweater can take you from chilly mornings to humid afternoons to breezy nights. A versatile piece that will go wonderfully with literally everything from denim to dresses. Though it’s summer, spring, fall, or winter, a denim jacket is an absolute must-have closet staple. 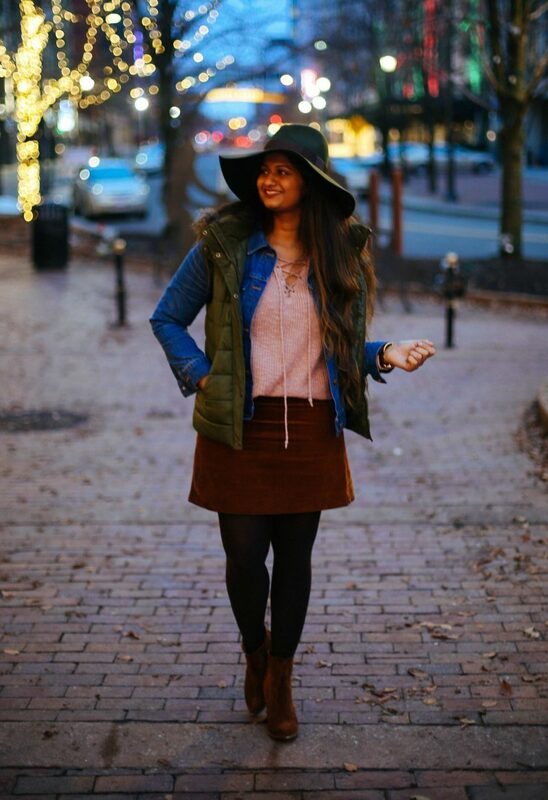 Wear it over a sweater for less chilly days and layer it with a puffer vest or jacket when it gets chilly. The scarf is a wonderful way to add color and warmth to your outfit. Whether its an infinity scarf, blanket or a solid fringe scarf, opt for bold colors and prints like yellow, neon green, violet and red plaid. Skinny jeans are a staple for colder months as they go with all winter boots from ankle boots to snowshoes. For extra warmth opt for corduroy skinny jeans. No matter how the trends evolve, a puffer jacket always tops in functionality and style. 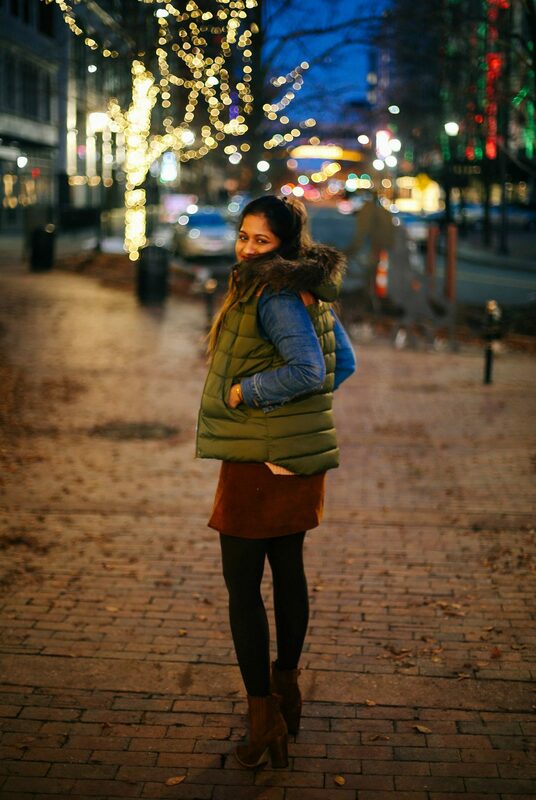 Choose a mid or full-length puffer jacket if you live in colder areas and a shorter version if you live in little warmer areas. Choose a coat that will make any minimal outfit stand out. Coats in bold accents such as yellow, plaid, green, coral, red, etc. If you think the fur vest is not your cup of tea, then I would suggest to re-think. This snug piece is not only comfy but is a fashion-forward piece that can instantly make you look stylish. A good quality fur vest leaves an elegant and feminine vibe. Crossbody bags are the most hassle-free bags in winter as you don’t have to hold them or worry about them slipping over jackets when worn crossbody. Whether protecting your noggin from cold or concealing a bad hair day, a hat is easily a year-long accessory. Pom beanies are the cutest winter accessory that can instantly give you a youth look. A cute summer dress can make it to your winter wardrobe with knit legging and cardigan. To keep the look fun, choose colorful tights in purple, green, or yellow. Weather lounging near a fire-place or heading to work, a knit tunic or dress with tights or legging is a classic winter wear. Choose turtleneck tunics or dress for extra warmth.